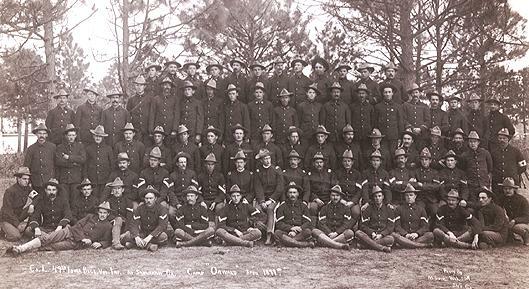 This is an image of the 49th Iowa Volunteer Infantry, Co. L. The photo was taken at "Camp Onward" in Savannah, Georgia in April of 1899. In the back row, the sixth soldier from the left is Thomas P. Sutton. The following is the printed history of the 49th Iowa, Company L and biographies of its officers. "Company L was organized in June, 1892, as a part of the First Regiment of the National Guard of the State of Iowa, with C.L. ROOT as Captain, F. L. HOLLERAN, First Lieutenant, and Geo. M. MICHELSON (now deceased), Second Lieutenant. When the call for volunteers was made, Company L immediately responded and was mustered into United States service in Des Moines, Iowa, on June 2d, 1898. Captain ROOT failing to pass the examination, Captain C. C. McCOLLUM, the Regimental Adjutant of the First Regiment, Iowa National Guard, was elected Captain, May 29th, 1898. First Lieutenant F. L. HOLLERAN also failed to pass the examination, and was succeeded by Geo. M. MICHELSON, then Second Lieutenant. John B. NATTINGER, then sergeant, was promoted to Second Lieutenant. Company L was the only Company from Iowa to attend the unveiling of Logan's monument in Chicago. The Company is composed of a fine body of men, and was one of the best drilled in attendance and won much applause. Captain C. C. McCOLLUM was born August 14, 1853, at Detroit, Michigan, and followed the mercantile business in St. Johns, St. Louis and Grand Rapids, Mich.,for some years. Since 1880 he has been in the employ of the Chicago Northwestern Railway Company, in the accounting department, and occupied the position as store keeper at Clinton, Iowa, which position he immediately gave up on the call for volunteers--April 25th, 1898--and reported for duty at Des Moines, April 26, 1898, and was elected Captain May 29th, 1898. He was connected with Company B, of the Second Regiment of the Michigan National Guard for about four years, attaining considerable experience in military tactics. Captain McCOLLUM had proven himself a most efficient officer, and is very popular with his men, in whom he takes a great deal of pride, and is always looking after their welfare. Second Lieutenant John B. NATTINGER (acting at present as First and Second Lieutenants, owing to the death of First Lieutenant Geo. M. MICHELSON) was born in Lyons, Iowa, twenty-four years ago. He was brought up and educated in the public schools of that place. Joined Company L when organized in June, 1892. Was elected Second Lieutenant in June, 1898. He is a good officer, and in civil life is a dry goods clerk." Sutton, Thomas (contributed unit photo, which includes his grandfather, Thomas P. Sutton).